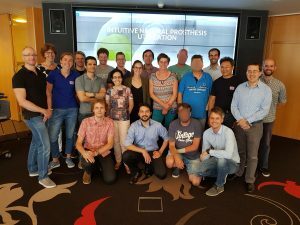 On 17 and 18 July 2018, the 3rd consortium meeting of all INPUT project partners took place at the University Medical Center Groningen. 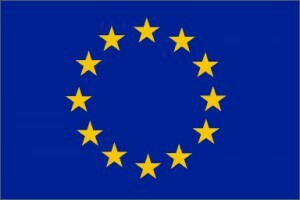 This meeting focused on the upcoming patient tests and the testing of a prototype of the complete system. 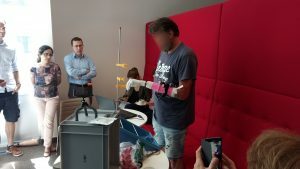 In the context of this meeting, the successful cooperation of the control software implemented on the microcontroller with the control of a prosthetic hand could be tested. Both the hardware components and the control software could be put into operation without any problems and enabled tests with 3 different test users. The INPUT hardware setup, consisting of a liner and measuring electronics, made it possible to measure and process the EMG signals of the test users. The raw EMG signals could be assigned to virtual gestures of the phantom limb via the algorithm implemented in the microcontroller. Thanks to the support of orthopedic technicians from Groningen, it was possible to supply three test users with the prosthetic system. After a short training phase it was possible for one user to perform an ADL test (clothspin relocation test). It was possible to implement the clothespins according to the test instructions. The test user described the type of control as very intuitive and easy to learn. He could imagine using this control variant outside the laboratory as well. The other two users could not be provided with a test prosthesis on site due to the anatomical conditions of the amputation stump. However, this gave us important insights into the possible problems of the coming clinical studies and we will change the design of the liner on the basis of this experience. Modification of the liner concept for the clinical studies. Instead of a fixed liner size, a cuff made of liner material is used here in order to be able to better supply different stump geometries. 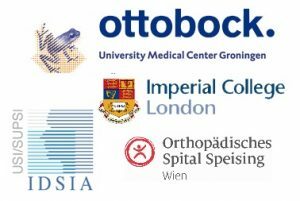 Preliminary investigations with the Cuff electrode tape in the orthopaedic hospital Speising. Production of the liners in larger quantities to enable the planned clinical study.